We've been covering the 2011 Stockholm Furniture Fair for the past week, delving into everything from the heavy hitters on the main show floor to the promising young designers debuting prototypes in the Greenhouse. But one can't forget how important it is to soak up what's happening at satellite events around the city, where the creative types gather in the evening to have a drink or four, toast both the powerhouses and the rising stars, and just blow off steam from a day of meetings. Here we present a few images from the week. One of the most talked-about events was the temporary, invitation-only exhibit 20 Designers at Biologiska, at the Biologika Museet (Biological Museum). 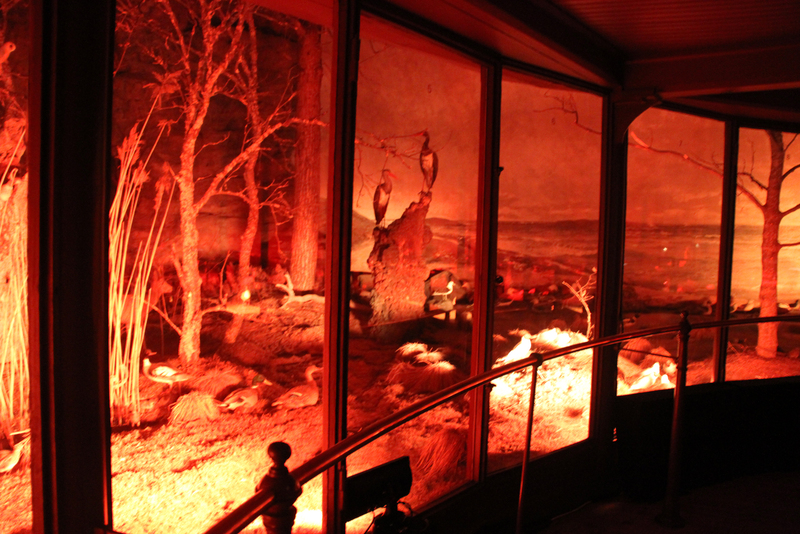 Located inside a circa-1893 structure on Djurgården, the museum is basically a two-story cylindrical diorama that holds a collection of stuffed wildlife. Curated by Fredrik Färg, Emma Marga Blanche and Hanna Nova Beatrice, the exhibition is "about evolution, diversity, and universality, where contemporary design, art and light is housed in an unexpected context." The trio of young curators hand-selected twenty of their favorite designers and invited them to display their pieces alongside the artificial scenery inside the museum's continuous diorama space. Pictured here is the burnt-wood Ausgebrann stool by Belgian designer Kaspar Hamacher. The Biologika Museet is almost a Guggenheim in Bavarian-inspired miniature—the exhibition space winds around the perimeter of the cylindrical building, emphasizing a gradual interaction between the viewer and the artworks. The building's style is said to be influenced by medieval Norwegian churches. Hand-painted backdrops are by Bruno Liljefors. A standout in the exhibition—engraved glass works by Berlin–based designer Mark Braun. Created for the famed Austrian glass company Lobmeyr, the series, called Fortune, delicately depicts topography and other scenes from nature. The designer says his creations are meant to emphasize the "essential wealth in everyday life." Pieces by Fredrik Färg, whose surname actually means 'color' or 'paint' in Swedish. Funny, then, that his work is usually black or white. Two of the three curators of 20 Designers, Emma Marga Blanche and Fredrik Färg, were also in attendance later in the same evening at Design House Stockholm. In addition to being co-curators in the design world, they are also a very cute couple in real life. The Design House Stockholm party was one of the best attended, with the company's CEO, Anders Färdig, playing emcee. He has quite the booming voice, perfect for theatrics and only enhanced by his headset-microphone. He was speaking in Swedish, so the monolingual Americans could only guess what he was saying—but judging from the crowd's reaction, it was very rousing and funny. Designer Alexander Lervik, who created the Light Bar on the show floor at the furniture fair. He recently won the commission to redesign the Nordic Sea Hotel. Next stop: Swedese, a company that works with international designers but manufactures everything in Sweden. The white chair at center is the emblematic Lamino, the company's best-selling product, designed in 1956 by co-founder Yngve Ekström. The Ivy bookshelf, one of Swedese's latest introductions, by Thomas Bernstrand. The piece, which just won Form's +1 award, can be stacked three different ways. Another new introduction this week—the "stackable for days" Spin table, designed by Staffan Holm. Swedes love stacking things. Next stop: Asplund. There, the company's CEO, Thomas Asplund, said he asks himself one question only when selecting which pieces to carry in his eponymous shop: "would I have it in my own home?" Thomas Asplund enlisted Italian designer Paola Navone to re-issue her Log 99 stool, in white, to be sold exclusively at the Stockholm location. Couldn't resist—Monkey, by Kaj Bojesen, created for Rosendahl in 1951. Spotted on the shelves at Asplund. British pop duo The Pipettes played for a full house at NK Inredning, the luxury department store that hosted an evening toasting the intersection between UK and Swedish design. Among those in the audience (and among the designers celebrated that evening): Sebastian Wrong, of Established & Sons. Later, at Blå Stationen—where they served an amazing herring-in-cream dish with potatoes and bacon that's a late-night-party mainstay in Sweden—we ran into Andreas Engesvik, who creates furniture and lighting for Muuto, Ligne Roset, StokkeAustad, and many others. We talked about the importance of friendly collaboration and respect among designers, and the need to mentor young up-and-comers. "The guys from Claesson Koivisto Rune took me to dinner long ago, and listened to my ideas, before I'd done anything," said the Oslo–based designer. "I'll always remember that." The pendants behind him are called Space-Time, constructed of painted polythene by Karim Rashid for Zero. We end with one of the guests of honor at the NK Inredning party, Spanish designer Jaime Hayón, who unveiled a whole slew of new items at the fair, including pieces for Fritz Hansen and Sé (sneak peek slideshow coming soon). His words of advice for young designers just starting out: "Focus on your identity, where you come from. We are all unique—don't let outside influences change you. "There's more Stockholm design coverage to come, please stay tuned! To see images from Stockholm Design Week, please visit the slideshow.